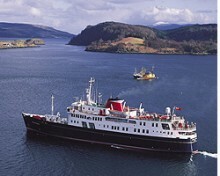 Hebridean Island Cruises have released their 2012 Schedule. For Hebridean Princess it is her 24th operating season and many new itineraries have been introduced including three cruises to the Emerald Isle during August – re-introduced after a break of several years.New and well-tried Footloose cruises feature throughout the year and the Northern Isles itineraries are well supported in June and July. The five night Gastronomic Tour of Skye cruise will operate in June, accompanied by the author Frances Bissell. By booking early you not only have the best opportunity to secure the cabin and cruise of your choice, but if you book before 31st May 2011, you will receive a 10% Early Booking Saving. In addition to the 10% saving as above, a further 5% Early Booking saving can be made on several cruises – call for special offers. Hebridean Cruises are All Inclusive – Meals and Drinks, Guides and Guest Speakers, Shore Visits, Bicycles, Internet, Extra Activities, Port Taxes and Gratuities are all included.